We spent Saturday at Kentucky Lake with some friends. 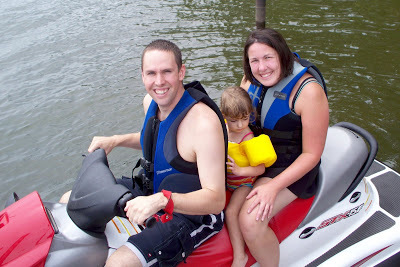 Riding the jet ski was fun, but my favorite part was tubing … Yes, holding on so tightly to the tube attached to the back of the jet ski that my upper arm muscles ached the following day, only to be thrown off the tube into the water with such force that my legs have a few bruises. As strange as it sounds, that’s my favorite lake day activity. Me: Cate, do you want to ride with us? Cate: (Backing away from us …) No. No. Me: It’ll be fun. We’ll hold on to you. Me: Yep. Daddy is going to drive us in the water. Cate: I wanna go home. quite clearly, she was NOT a fan of the jet ski!